As is with the case of books, you should not judge an album, EP or single by its cover. However, one look at the artwork for this 10” release, and you can’t but help admire its absolute beauty. So, having already heard both tunes contained within, I decided to snap up a copy quick sharpish, especially because it comes with a poster of the artwork, which is by the terrific Poalo Girardi. That being said, artwork is one thing, but it’s the music that really counts, so what do we get with this single? Two tracks are all you get here; one from Philadelphia’s Ashencult on Side A, and one from Mephorash, who hail from Uppsala, Sweden. But, oh my, what damned fine tunes they are. This single is a perfect example of showcasing two slightly differing styles of Black Metal, and two exceptionally fine examples of Black Metal. Ashencult offer up a more furious assault with their tune, My Tenth Death, with the haunting and atmospheric intro leading us into a maelstrom of absolute venom. It’s executed perfectly, and this being the first new material since the release of their debut album, bodes well for the future. In fact, if My Tenth Death is anything to go by, their next album should be blisteringly good. It’s not until almost the two minute mark, of a 7min 40 sec song, that is really reaches top gear, but when it does it rarely lets up. This is a torturous assault of the highest caliber and I assure you that you will have this sucker on repeat. Yes, it is incredibly good. Flip the disc over and we get treated to Atramentous Ungod Suspect from Sweden’s Mephorash, and right from the start of this unholy slice of hell, you know you are in for a treat. This is as ungodly as its title would suggest, and whilst it offers up slightly more variety in structure than Ashencult’s tune, it nevertheless blasts from your speakers at top speed. You better pace yourself though, as this critter clocks in at almost nine and a half minutes, which allows the song to ebb and flow through its malevolent journey; a journey that will leave you breathless. Quite simply Ashencult, Mephorash and Unholy Anarchy Records have delivered, in my opinion, the single of the year. If you want a physical copy though, and you should, you need to get in quick. Only 500 copies have been pressed (350 black and 150 silver vinyl) and at the very most there are only 499 left (yes, the silver vinyl is very nice!). You can here both tracks on Bandcamp, but quite honestly they both sound far better on vinyl. Opus Sermens is USBM and Swedish Occult BM in perfect unholy alliance. 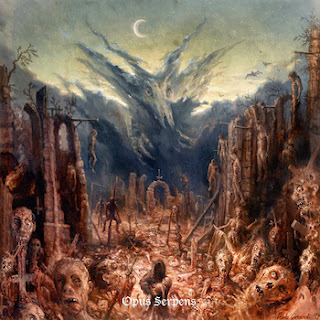 Opus Sermens is released by Unholy Anarchy Records and is available here.